On Saturday I took Owen and Oliver with me on the CAS hiking trip. CAS stands for Creativity, Action, Service and is part of our International Bacchlaureate program at our school. One of the seniors, Luka, is an avid hiker and he planned out a great route for us. 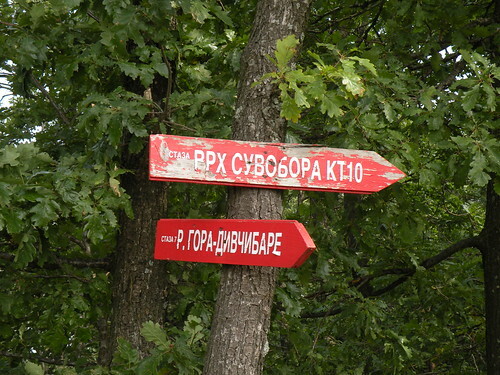 The trail is part of a larger system of trails in Serbia and there are hiking clubs here. Trying to find basic information about them is difficult and I haven’t seen any maps. Because of Serbia’s isolation for many years, these types of things aren’t developed yet for tourists. 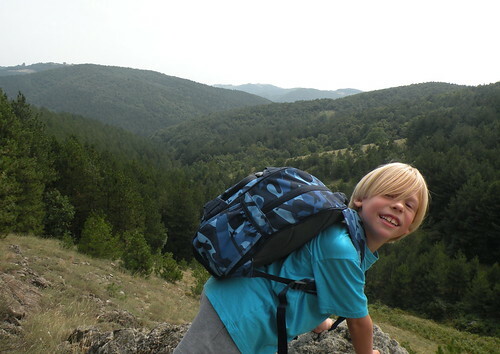 The hike took place outside of the village of Slavkovica, which is located north of Čačak. It is part of the central Serbian region known as Šumadija (Wooded Land). The land of Sumadija is a mix of rolling hills, pastures, pine and deciduous forests, villages, and orchards. The hike contained all of these and was a very pleasant day. This specific hike and village are not mentioned in the Bradt guide to Serbia. The route began at a restaurant, and it was under 2 hours from Belgrade. The high school students were patient and kind to the boys and they loved hanging out with the high schoolers. I had to carry Oliver in some of the parts, but both of them did very well. We hiked from 10:30 AM until 5:00 PM and they kept up the entire way. Šumadija being central Serbia, was and is the most “Serbian” part of Serbia. The two uprisings against the Turks started here as well as resistance to the Nazis in WWII. It was the center of the Belgrade Pashalik in Ottoman times. I think at its heart, Serbia identifies itself with the small family farm. Although Belgrade is cosmopolitian, many Belgraders have relatives still living in the countryside. The trail is well marked, although there were several trails intersecting that might be confusing. Red and white circles and signs (above) guide hikers. You need to read Cyrillic and the top sign indicates the direction of our goal. A WWI battle occured at Suvagora Summit between the Serbs and the Austro-Hungarians. There were several parties of hikers and there is the occasional farmer or local that you can ask if you get lost. We spotted some hang gliders on the way back. 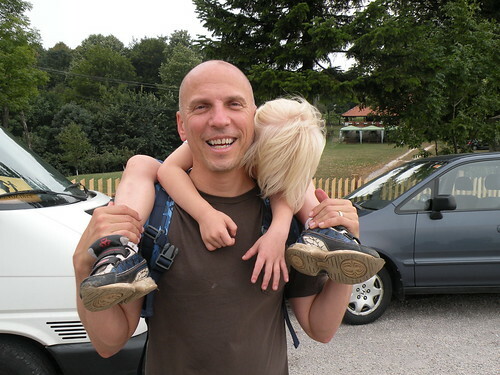 And with many of my hikes with Oliver, it ended up with him falling asleep on my shoulders as we headed down the final decline to the car. "Hitting the Wall" We Made It!